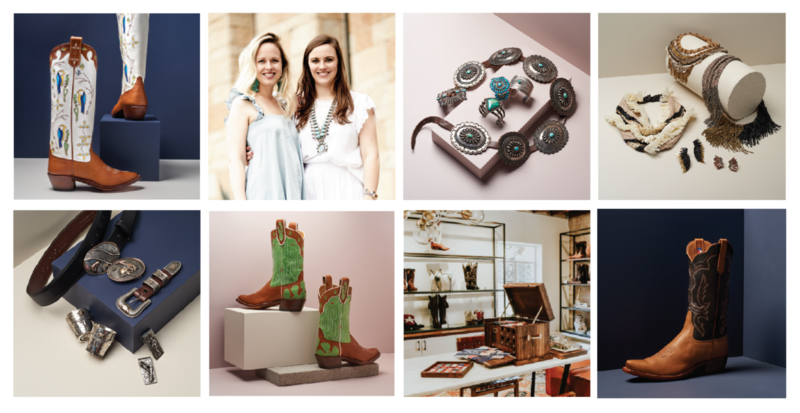 Tell us a little bit about Miron Crosby..
We opened our flagship store in Highland Park Village this past month stocked with our signature line of colorful cowboy boots for women, men and children. As fifth generation cattle ranchers from Van Horn, TX — very close to Marfa! — we grew up designing numerous custom pairs for ourselves to wear everyday. When we were both living and working in New York City, we took our boots with us, and were stopped on the street by people asking where we purchased them; those brief conversations sparked the idea to create a fashion-forward line with a western silhouette. We guide our designer — who is based in New York — with our inspiration that sometimes ranges from images of Chihuahuan Desert flora and fauna to Frank Lloyd Wright’s Prairie School architecture. Our inaugural line features an iconic tall cowboy boot, a shorty and a novel midi-boot, all crafted with luxurious leathers, exotic skins and stitching. In addition to our stock collection, we also offer a custom program where one can choose their own materials, colors, even add a monogram to fashion the boot in their own style. To complement our boot selections, we also carry a highly curated line of accessories such as turquoise jewelry and belts by Shiprock Santa Fe, barware and buckles from Comstock Heritage and contemporary jewelry from Mignonne Gavigan. A little West Texas side note, Baxter and I working on a fun West Texas project to be released this fall and we can’t wait to share more with you! West Texas is truly our happy place – our favorite spot to go, relax and unwind. Since Lizzie and Sarah are our new neighbors, I decided to ask them for some local travel tips. Being true West Texas locals, what are some ‘local’ tips that you both would give to someone traveling to West Texas? First, swing by Miron Crosby to pick out a pair of West Texas-worthy cowboy boots. If you are flying into Midland, grab a rental car and head to Terrezas Restaurant in Pecos for lunch. Order the enchilada combination with a fried egg and cool it off with a Tecate. Next drive west to Balmorhea. Make a pit stop at the local gas station for a cooler, beer, water and sunflower seeds. Balmorhea State Park is a short drive (don’t blink … you’ll miss it! ), and the Springs are absolutely worth a visit. Jumping off the high dive is a fond childhood memory, and I love to lounge on the grassy lawn with views of the Davis Mountains. Next stop is Fort Davis, and a chance to visit the kitschy Rattlers and Reptiles, see the historic fort and stop for chocolate malts at the Fort Davis Drug Store. If in need of an authentic cowboy lid, stop in Limpia Creek Hats. 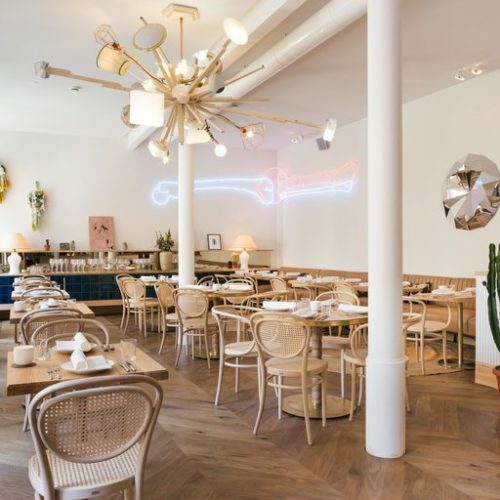 Marfa is 30 minutes down the road, and I alternate between staying at the Hotel Saint George or Hotel Paisano. At the Paisano, book a suite overlooking the courtyard — this is sentimental to me as it’s where I stayed the night before I got married. For cocktails, the Paisano Courtyard and a spicy margarita is my happy place, though the newer Capri bar is super chic and quite the scene. For dinner, Cochineal is a long-time favorite – I love to book a table al fresco under the olive trees adorned with twinkle lights. A nightcap at the Lost Horse Saloon is a must-do before a walk back to the hotel under the vast west Texas sky known for its canopy of stars. Fill the Marfa days with trips to the Chinati Foundation, tours of the local galleries, an appointment at Garza Marfa, and pull on those Lulus for a hike up the stairs at the historic Presidio County courthouse. For dining, my favorite lunch spot is a hole-in-the-wall Mexican food place called Mando’s, which serves the best greasy burger, bean and cheese botanas, and the coldest Dos Equis this side of the Rio Grande. Also not to be missed is the Food Shark food truck and the charming downtown Stellina. Jaunts out of town to both Prada Marfa and the McDonald Observatory are worthwhile. Call ahead to book a star party at the Observatory – it’s really memorable. If time is on your side, a hike or canoe trip through Big Bend National Park is breathtaking. One evening, take a drive out to the Marfa lights observation area (which do exist! ), to see if you can spot the elusive beams. The lights really are magical, and the observation area was the hot make-out spot in high school. Understandably, this was at the top of my list when I brought my now husband home to West Texas for the first time! Wrapping up your trip, take a different route back to Midland and experience the scenic drive between Marfa and Alpine. The chicken-fried steak at the original Reata can’t be beat. Stop in at Big Bend Saddlery and see our friend Gary Dunshee, our Dad’s saddle maker. Place an order for beautiful custom-hand-tooled leather goods or stock up on other West Texas wares — a fantastic way to commemorate your trip! What was it like growing up in West Texas? 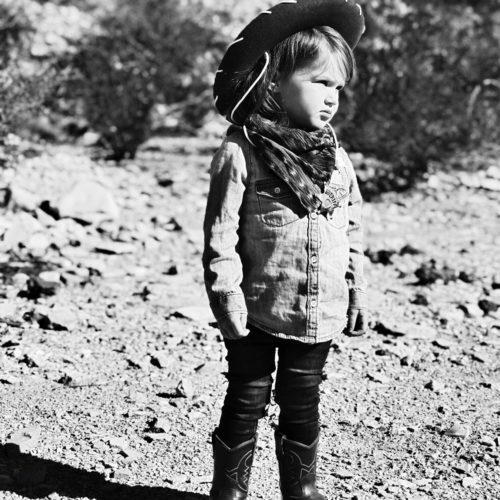 Sarah Means: Along with our brother Coley, Lizzie and I grew up on our family’s working cattle ranch outside of Valentine, between Van Horn and Marfa, which has been in operation since 1884. Our father is a bona fide cowman, and he runs the ranch with my mother, so we grew up as ranchhands — making rounds to check water tanks, riding horses, weaning calves, and always helping out with the spring round up. In college, this inevitably fell the week of spring break, and we both laugh at how bitterly we resented our parents insisting that we head home to windy, dusty west Texas to work cattle when our friends were bronzing in Cabo and Acapulco. Our Dad is all-western. He doesn’t wear loafers nor dress shoes — he has Rios of Mercedes cowboy boots for every occasion (and cowboy hats, which he sports everywhere). He wears beautiful clothes, a byproduct of our super chic grandmother who used to pick us up for rounds on the ranch in her dusty Jeep, wearing Escada sweaters and Ferregamo shoes. Our mother is very glamorous, and very much a “city girl.” She actually refused my Dad twice when he asked her to marry him, because she couldn’t imagine living on the ranch. He convinced her, though, and it’s the dynamic combination of their aesthetics that has shaped us. Our childhood home is a very cool mix of the two of them — a baby grand piano has become the staging area for part of my Dad’s extensive spur collection, and atop my great-grandfather’s vintage Navajo weaving sits a cabinet boasting my Mom’s extensive collection of Herend and Royal Crown Darby china. It is really our Dad that pushed us to go ahead and start Miron Crosby when we did; he just seemed to get it, and he, even more than my Mom, loves the design side. He picked several of our leathers, and has outspoken opinions about even the decor in the studio. In the back of my mind, he’s always the benchmark for our designs. 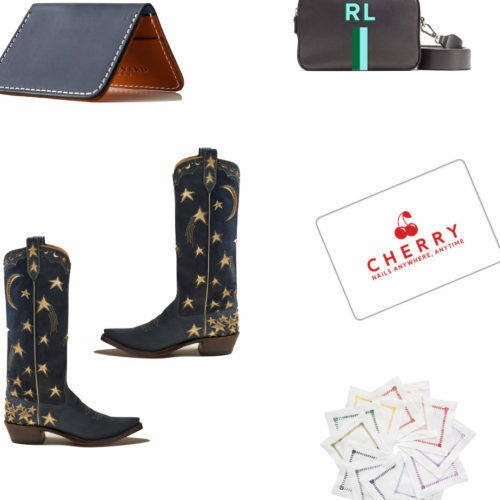 Our cowboy boots are hand-made in Texas by artisans with decades of experience, but we are working with a design team in New York, and have created our collection for a fashion customer versus a western one. Still, I ask myself anytime we’re developing a new design if the infrastructure behind the design is something Dad would appreciate, if it is something I would feel comfortable wearing at home on the ranch or shopping in the Lower East Side. For us, that’s the sweet spot. To stay in the loop with Miron Crosby, be sure to follow them on Instagram here!